This soup is another wintery recipe that relies heavily on pantry items (here chickpeas and barley). The only contribution from the garden is our Italian parsley which is thriving in our cool weather. This is a filling vegan soup that is loaded with protein and fiber. Gently saute onions and celery in olive oil until soft. Add stock, barley, marjoram and nutmeg. Simmer, partially covered, for about 1 hour. Drain chickpeas but RESERVE THE COOKING LIQUID. Discard bay leaves. Puree chickpeas with 1 cup of reserved liquid. If too thick, add more of the reserved liquid to get a thick paste. Add pureed chickpeas to the barley and stock. Soup should have a thick, creamy texture. Add more of the reserved chickpea cooking liquid if the soup is too thick. Season with salt and pepper, and let soup simmer on very low for about 10 minutes to allow flavors to meld. Serve with chopped parsley on top, and a drizzle of olive oil. We added a dollop of feta to each bowl, and served with thick flatbread. *** We've received several questions about the cooking time for the chickpeas. We really did cook them this long, on a low simmer. You could probably cook for a shorter time -- just taste for flavor and softness to determine when they're done. 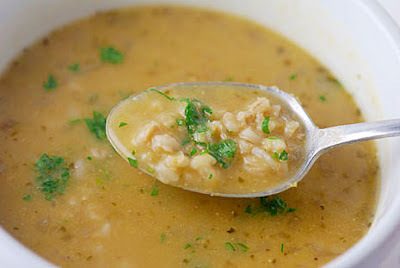 Tuscan Barley and Chickpea Soup made the Foodbuzz Top 9 today! The Foodbuzz Top 9 is a photo-driven collection of top-buzzed posts within the Foodbuzz community. Congratulations again, and thanks for being a part of Foodbuzz! This is just a perfect soup now the my son is home for a couple more weeks. He is such a chickpea fan. Pureed chickpea and barley, nice and creamy. I will try this. This looks awesome and I am craving soup BIG TIME! This is such a great vegan recipe- it's creamy without dairy :) Perfect! This looks wonderful. Maybe the secret to making chickpeas so I'll like them is this long simmer you are giving them? I don't know - I love chickpeas in dishes like hummus, but canned chickpeas to me have a funny texture I just can't get over. And it seems to be the bean of choice for a LOT of vegetarian dishes. Tell me - how do I start liking them? Or maybe I just substitute another light bean, like cannellini? Great recipe! I keep on being distracted with these great recipes, but I am staying on track tonight. Minestrone soup. I will save yours though! Thanks! This looks divine and so comforting! Be glad you have at least parsley left--all but a few green onions are what remain "alive" in my garden--how they are surviving is beyond me. It's been in the single digits at night! I love chickpeas, these would be a great weekday treat! lovely, and it looks so warming! Yay, more soup recipes. That's my addiction lately. I just can't get enough. Fiber and protein in one yummy-looking soup. That sounds perfect to me! I love barley soup and how do you make it better - chickpeas! This is a keeper! I need to use barley more often, really! This is another great soup. Sounds delicious! Barley and chickpeas go so nicely together. I love barley, I use it all the time. That's a nice recipe looks health and yummy. Great soup for winter! It's impressive that you simmered the chickpeas for so long. Is there some magic in that trick somewhere? I've always been too lazy and quick to reach for the stick blender! I'm drooling over the photo. It looks awesome! And congrats on your top 9 LOL! You deserved it. Brilliant combination. They're so perfect for each other and the texture is probably superb. 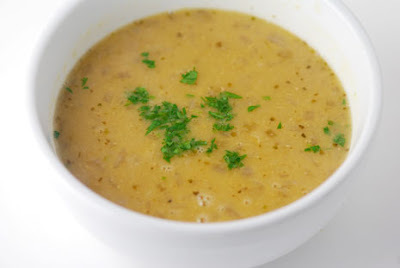 Chickpeas make such a great thickener for soups. It's shocking how they add great flavor and depth. Sounds great for this weather! Looks delicious! Chickpeas are a favourite in our house... heck, even the cat goes bonkers for them. :) Sounds like the perfect soup for a cold, snowy day when no one feels like going out to the supermarket. I like soup. It's great. Oh this looks so perfect right now. I actually can whip it up- I have all the ingredients. The snow is blowing- oh so percect! Thank you. Looks so good.... I have a bag of fresh chick peas, do you think that would do? I can't imagine boiling canned chickpeas for so long? Interesting! How long would you cook fresh chickpeas? Thanks for sharing such a comforting dish!